eMarketer estimates 2.46 billion people will use a social network at least once a month in 2017, which will represent one-third of the world’s population and an 8.2% gain over 2016. At least 71.0% of internet users worldwide will access social networking sites regularly this year. Asia-Pacific will lead the way, representing 55.1% of social network users, with China alone accounting for over 46%. Mobile phone adoption and improved mobile coverage will drive overall social network user growth. The number of mobile social network users worldwide will reach 2.01 billion this year, up 10.7% from 2016. Roughly four in five social network users will use a mobile device to access a social network. Facebook is far and away the most popular social network worldwide. Nearly 1.50 billion people will log in to Facebook in 2017, accounting for 60.8% of social network users. Approximately 87.2% of Facebook users will access the platform via a mobile device this year. More than 260 million people worldwide will use Twitter regularly this year, up 4.0% from 2016. While the audience is growing, Twitter continues to feel pressure from competing social platforms. The share of social network users worldwide who use the platform will contract from 11.0% in 2016 to 10.6% in 2017. According to Snap Inc.’s Q1 2017 results, their Snapchat platform has 166 million daily active users worldwide. 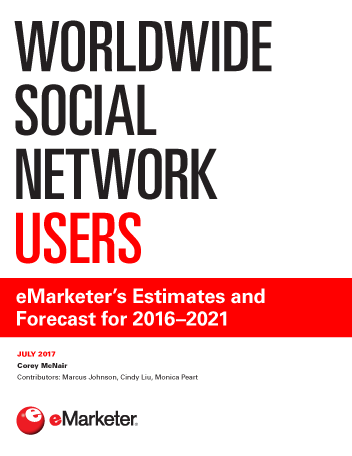 eMarketer will provide estimates for monthly active users worldwide in our next update of social network users: We expect 70.4 million individuals in the US and 13.6 million in the UK will use Snapchat in 2017. "In 2017, one-third of the world’s population and 71.0% of internet users will access social media. Among those users, 60.8% will be on Facebook and 10.6% will use Twitter."